More than a century ago, Upton Sinclair shocked the nation with his groundbreaking and best-selling novel, The Jungle, reporting on life for immigrant workers in Chicago’s harrowing meat-packing industry. Sinclair described workers slaving in unsafe, unsanitary and unforgiving conditions in the packing plants, as well as tremendous suffering endured by the animals who would meet their end inside of these industrial slaughter complexes. Over a century later, slaughter plant work is still among America’s most dangerous jobs, and farm animals still suffer in ways no person with a sound mind could condone. That is exactly the issue. Animal abuse impacts not only animals but people, too. In the U.S., our meat industry abuses billions of animals as if they were nothing more than assembly line production units, rather than living, feeling individuals. The vast majority of the animals raised and killed for food are confined indoors for essentially their entire lives, often in cages so small that they can barely move an inch for months or years on end. In fact, less than 1% of all animal products sold in the U.S. come from systems in which the animals spend their lives on pastures instead of in warehouses. Farm animals have personalities; they each have their own preferences. Chickens are adaptive problem-solvers, have impressive memories and can anticipate and plan for the future. Pigs are smarter than dogs, and researchers have even taught them to play videogames by controlling joysticks with their mouths. Most importantly — like all animals — farm animals want to avoid suffering. 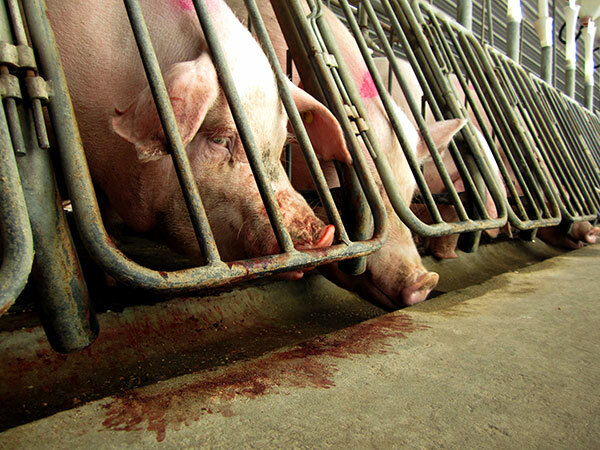 But the sad reality is that nearly all of them endure enormous anguish that only ends when they are slaughtered. What does this mean for those working toward a fair and just economy? In short, it means that if we are concerned about ensuring a fair shake for everyone involved in food production, we need to be concerned about everyone, both human and animal. There is no doubt that working toward improved treatment for workers is a good thing, in and of itself, and of course the workers expect to leave these facilities alive, unlike the animals. The fact that farm animals are not voluntary participants in the agricultural system raises further questions about whether the trade in their products can even be “fair” at all. What is worse, though, is that for a large number of farm animals, the suffering inflicted upon them is so vast that death comes as a blessing — it is the day when their misery finally ends. We take so much from these animals, including their lives; indeed the very least we owe them in return is a semblance of basic decency while they are alive. These animal welfare concerns extend to wild animals, too. The United Nations reports that animal agriculture, driven by our meat-centric diet, is a leading cause of global climate change, contributing 15% of all greenhouse gas emissions. The climate warming impacts wolves, polar bears and countless other wild animal species globally. This is one reason The Nature Conservancy, Sierra Club, Environmental Defense Fund, Natural Resources Defense Council and other environmental organizations are vocal proponents of reducing our national meat consumption. In addition to eating fewer animals (and more plants), there are many ways to improve how workers and animals are treated. For example, the Equal Justice Center and Western North Carolina Workers’ Center, two organizations dedicated to improving safety and rights for agricultural workers, joined The Humane Society of the United States’ lawsuit challenging the U.S. Department of Agriculture’s allowance of inhumane poultry slaughter practices that cause great suffering to both birds and workers. That suit did not prevail, unfortunately, but it is one example of many where these communities united to forge better agricultural conditions for all. Were he alive today, Upton Sinclair would likely be disturbed by how industrial agriculture still abuses animals and workers. He often quoted a fellow journalist from London’s Lancet, who reported that the conditions in large-scale slaughter plants constitute a “menace to the health of the civilized world.” A century later, that could not be more true. Every time each one of us sits down to eat, we can stand up for a less violent, more just world. I also wonder if the meat we do eat from these distressed animals is unhealthy because of high cortisol levels. I know we humans produce this when stressed and it is not a good thing to have hanging around in our bodies. Eating food containing high levels of cortisol makes absolutely no sense, along of course, with eating food high in anit-biotics or GMOs. Please consider these things! I want to know how the meat I buy is raised, if it’s humane or not!